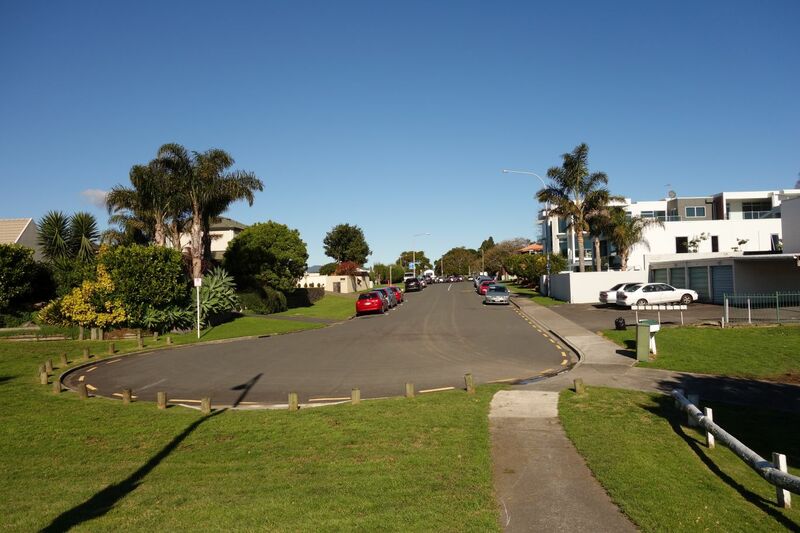 Several historical sites are easily accessible in the Tauranga City Centre, and a loop walk around the city can include those sites as well as other points of interest. 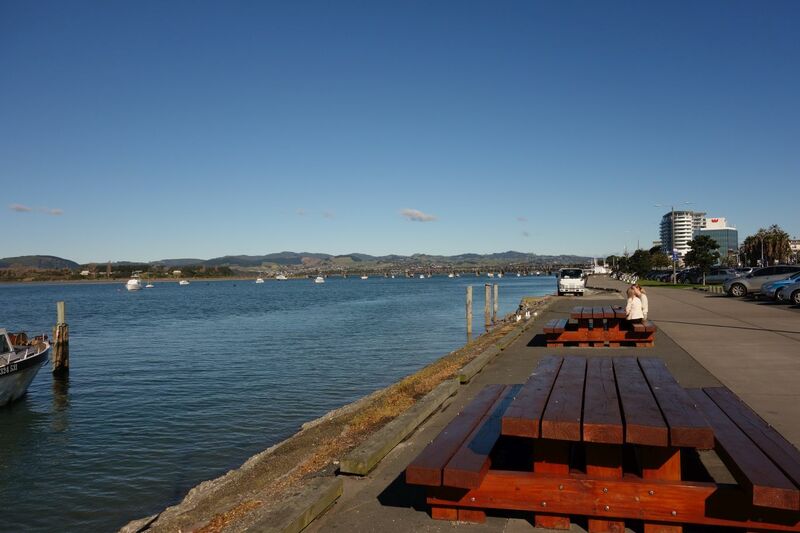 A booklet published by Tauranga City Council previously described the walk as “Tauranga / Historical Inner City”. 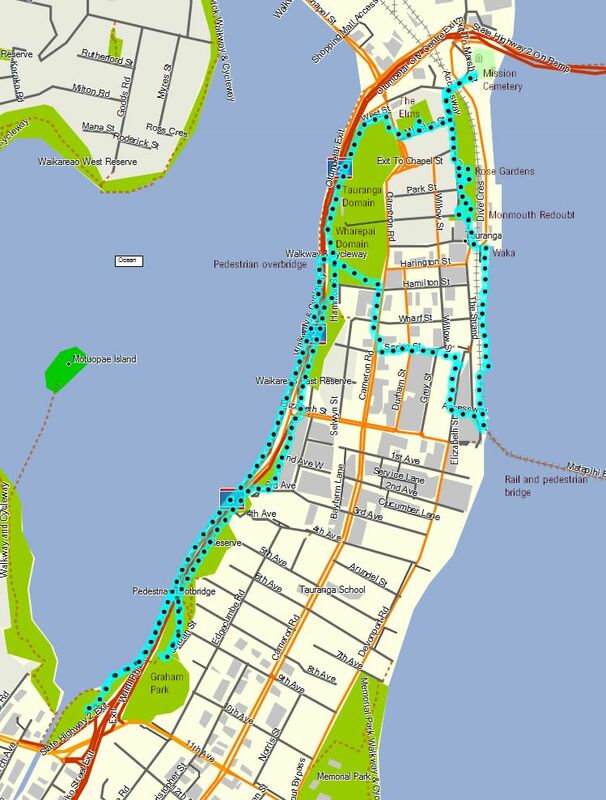 In later editions, as well as the online edition, it does not show the loop walk, and calls it Tauranga/CBD. 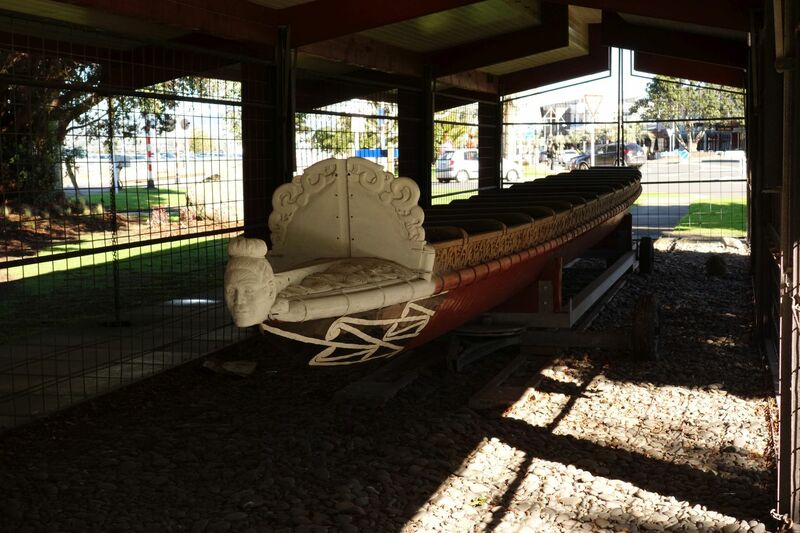 The historical sites are The Elms Mission house in Mission Street, Mission Cemetery, Monmouth Redoubt, Te Awanui Waka, and Wharepai Domain. Other points of interest include the Rose Gardens, Robbins Park, The Strand reclamation, and the Hairy Maclary sculptures. 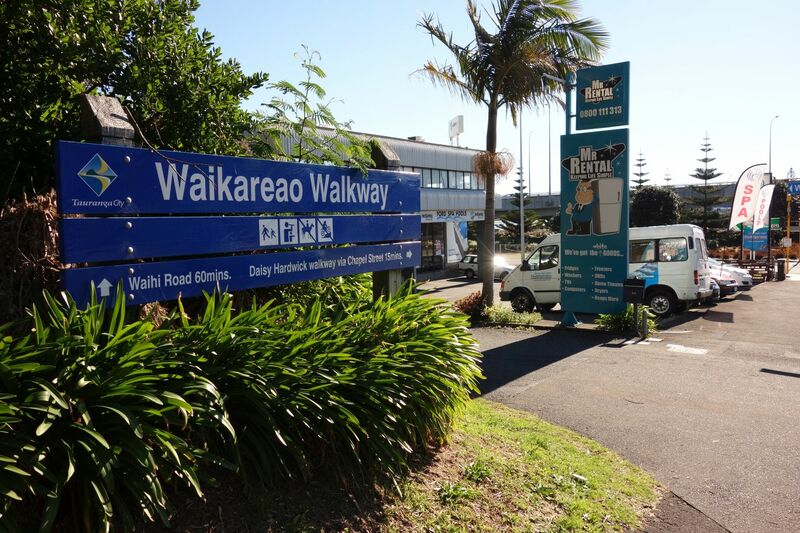 As well as the CBD this walk has a continuation of the Waikareao Estuary Walkway post, using the walkway on the eastern side of Takitimu Drive from Waihi Road to Chapel Street. 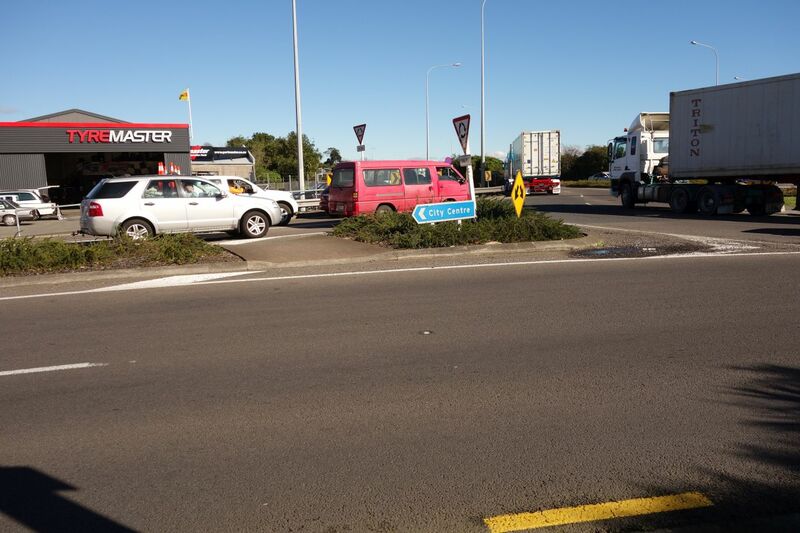 The walk started and ended at the parking area by the Waihi Road onramp to Takitimu Drive. Total distance was just over 9 kms, with a total time of 2 hours 20 minutes. 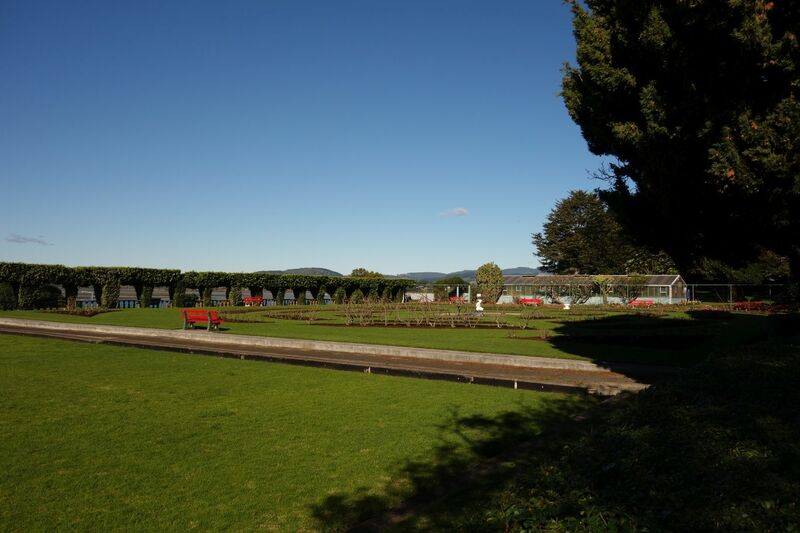 The central city loop was 4.5 kms long, and took 1 hour 20 minutes, although more time would be required if the walk included visits inside The Elms and the Mission Cemetery. The inner city walk can be accessed from multiple locations, and there are numerous options for visiting other locations along the way. 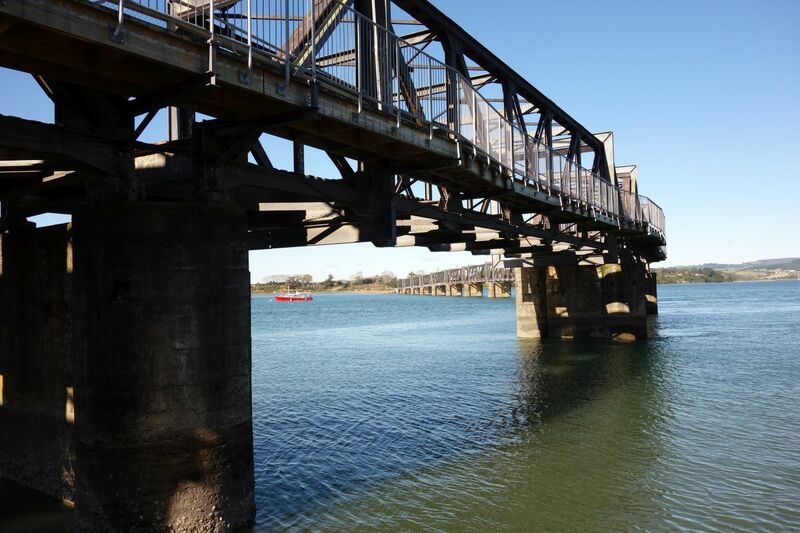 For example crossing over to Matapihi on the combined rail and pedestrian bridge. 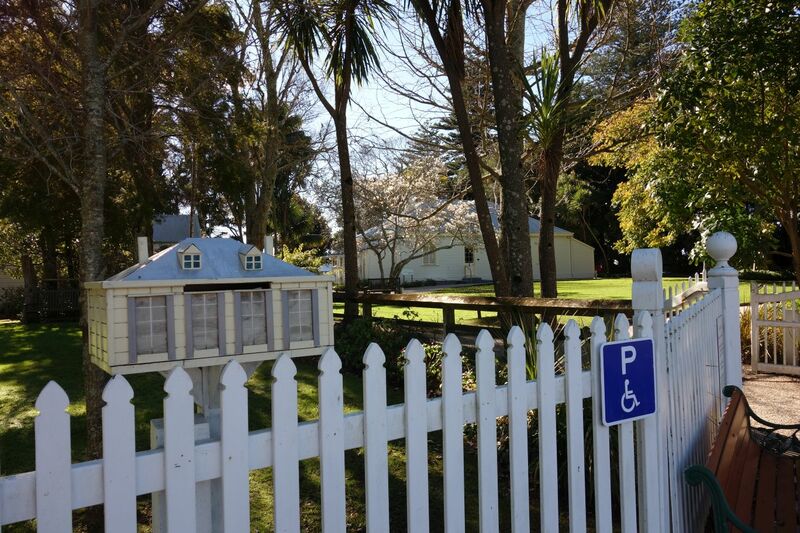 Toilets are available in several locations, including Wharepai Domain and the Rose Gardens/Robbins Park. 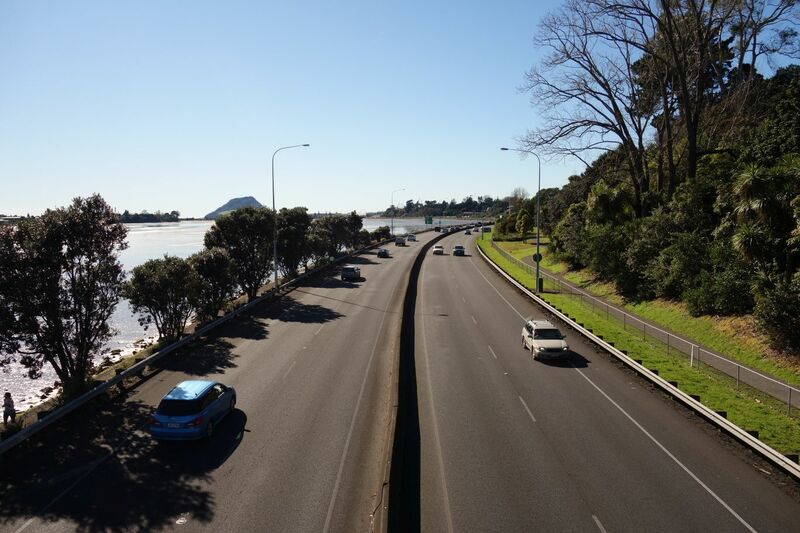 View along Takitimu Drive towards Mt Maunganui/Mauao from the pedestrian overbridge nearest to Waihi Road. At the eastern end of the bridge the Waikareao Walkway continues to the left, with the track to the right leading to Graham Park as well as access tracks to other streets. Someone has built makeshift accommodation under the trees alongside the walkway. 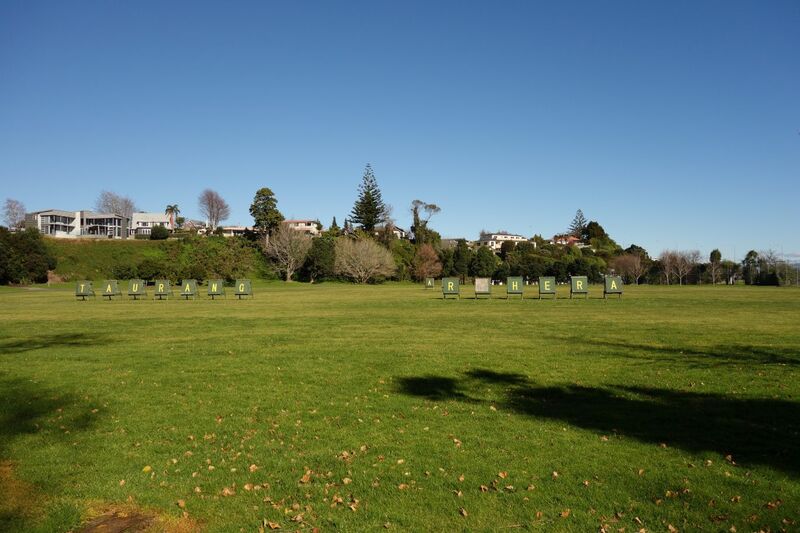 Tauranga Archers club have their home grounds at Graham Park, alongside and clearly visible from Takitimu Drive. 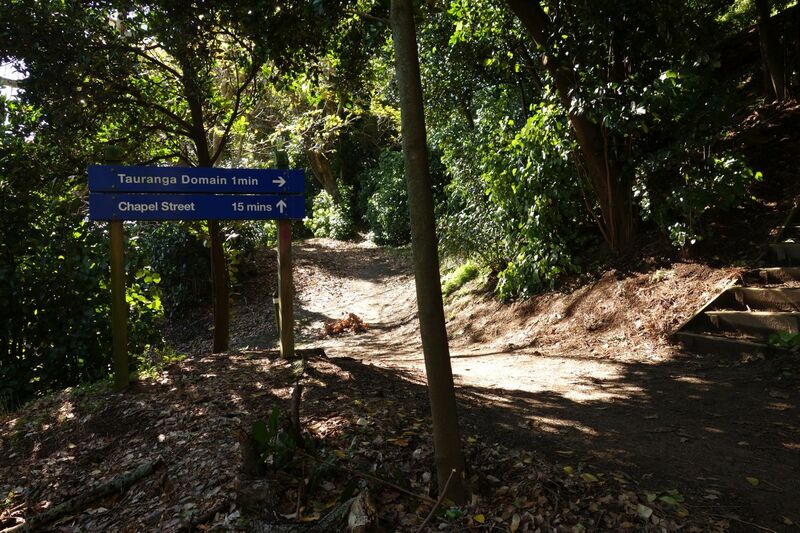 Heading north on Waikareao Walkway there is easy access directly onto Fourth Avenue. 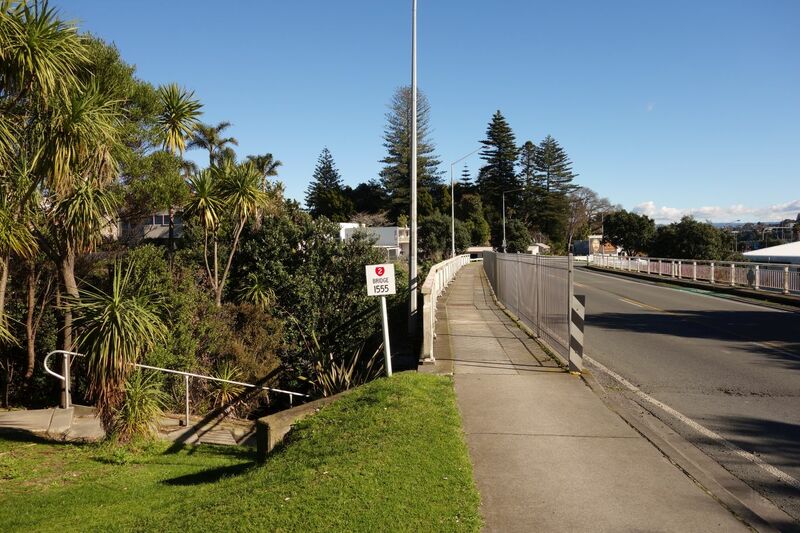 The walkway crosses over busy Elizabeth Street adjacent to the roundabout leading on and off Takitimu Drive. Care and speed is required to avoid being run over. 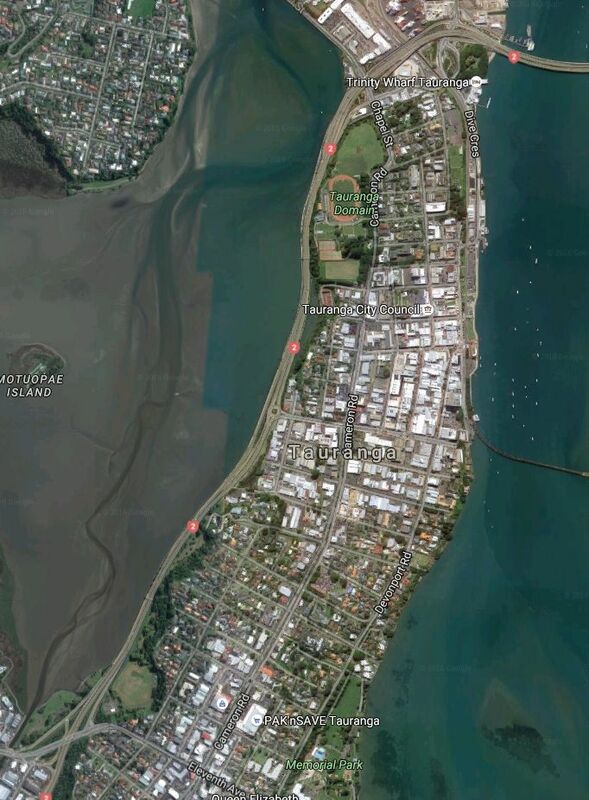 Part of the estuary is also found on the eastern side of Takitimu Drive, approaching Hamilton Street. Here at low tide. 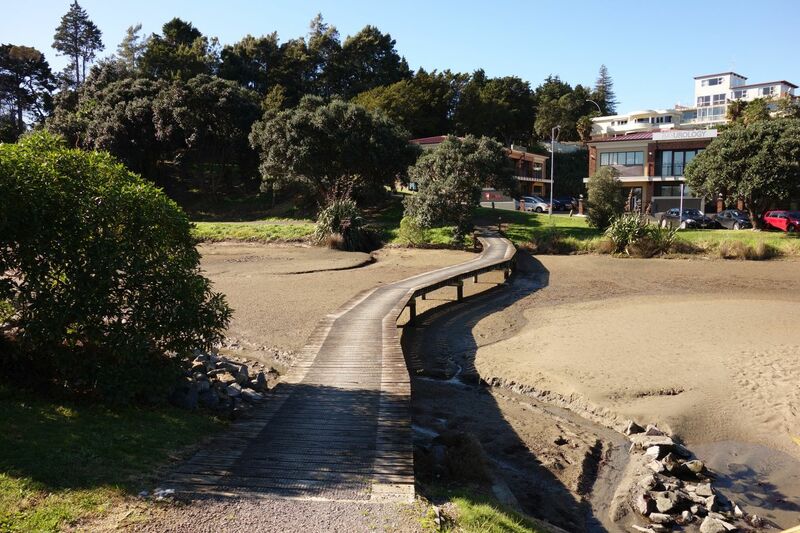 A boardwalk bridge crosses over the estuary to Hamilton Street on the other side. A short distance further on there are steps (on the far right) leading up the hillside to Wharepai and Tauranga Domain. 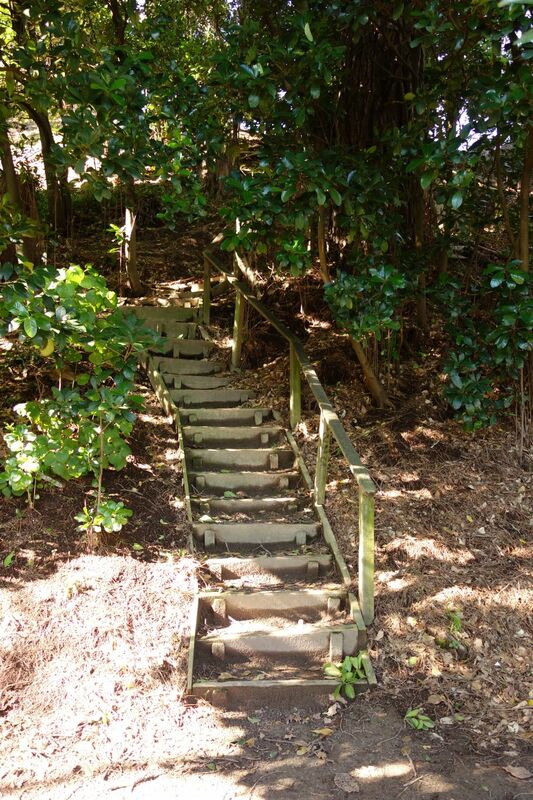 The steps are quite steep and irregular. 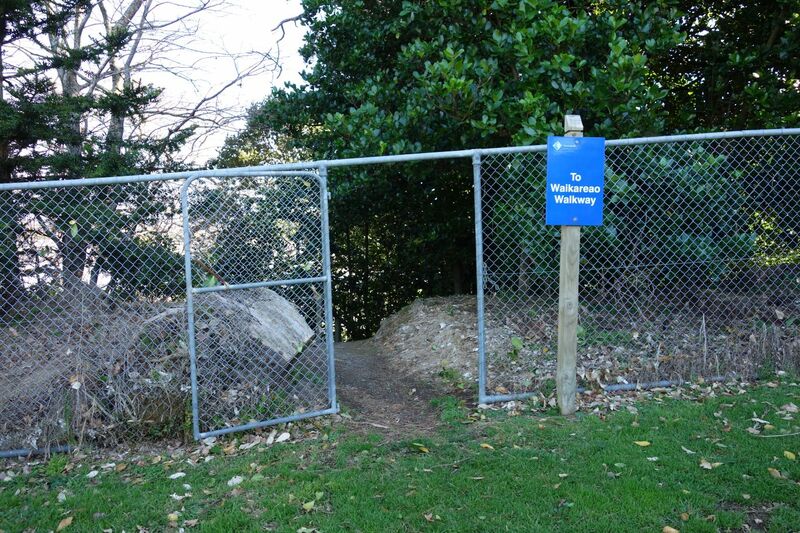 Immediately across the walkway from the steps is the northern pedestrian bridge across Takitimu Drive. The walkway ends on Chapel Street. 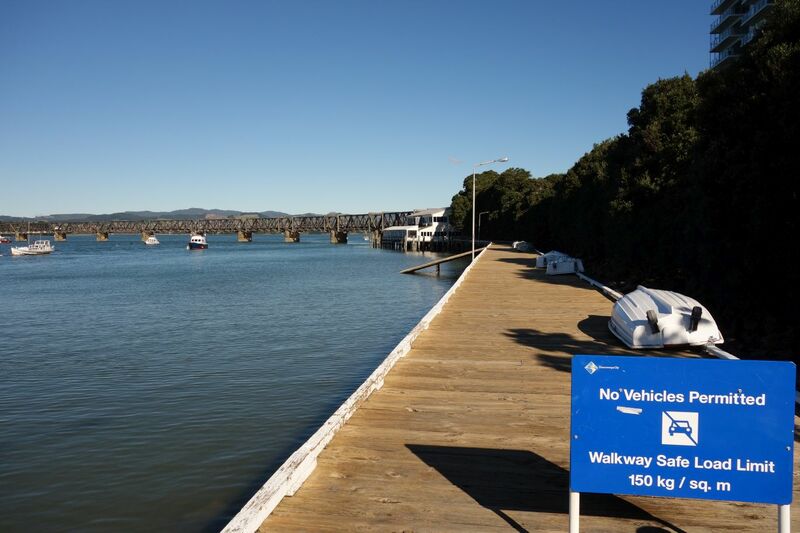 The Waikareao Estuary Walkway loop can be continued by turning left and following Chapel Street to Maxwells Road. Turning right leads up Chapel Road to Mission Street. The entrance to The Elms Mission house and gardens, open for a few hours each day depending on the time of year. The gardens are freely accessible, but there is a charge for entering the house. 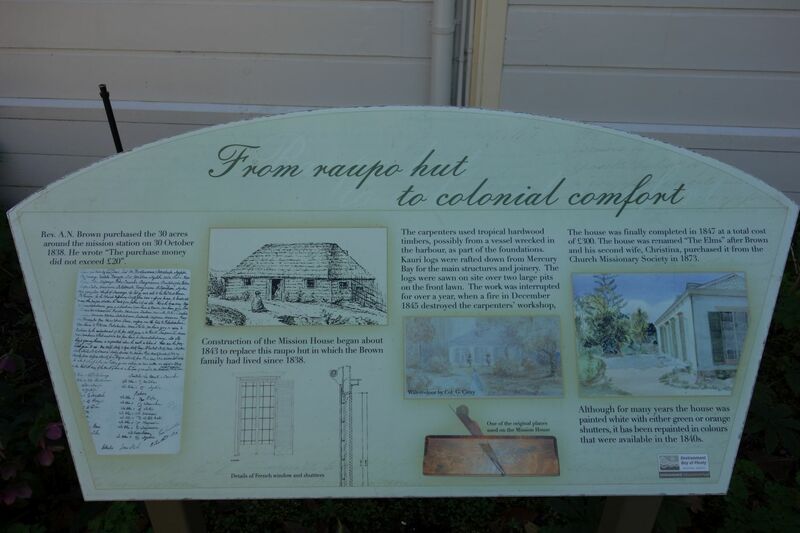 The house with historical details on an information panel. Click on the image to view a larger, readable version. 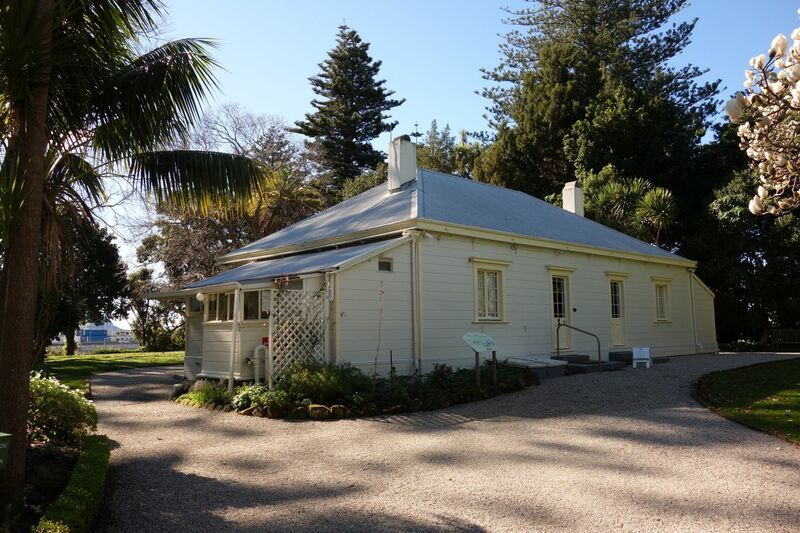 The Elms Mission house is the oldest building in Tauranga, and is owned and maintained by The Elms Foundation. Continuing along Mission Street and turning left on Cliff Road leads to the Mission Cemetery. Here looking back along Cliff Road towards the Rose Gardens and Monmouth Redoubt. 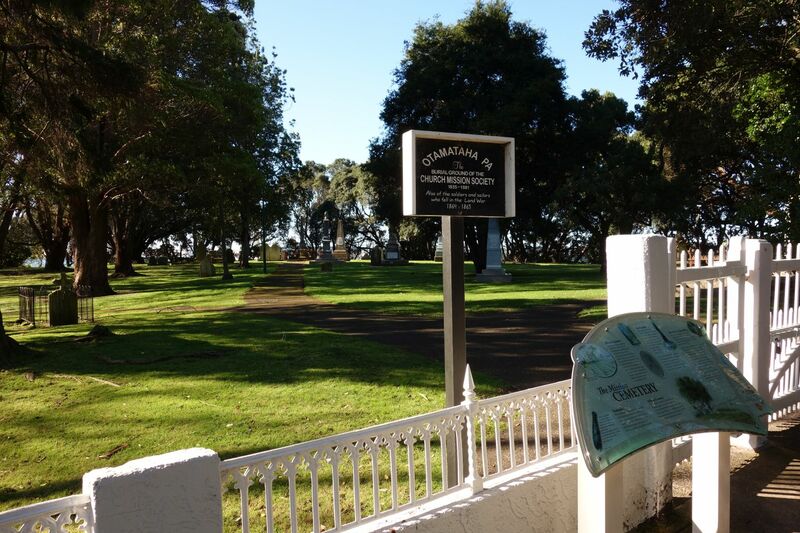 Turning right from the end of Cliff Road onto Marsh Street, and crossing the bridge over Dive Crescent leads directly to Mission Cemetery. Looking down from the bridge onto Dive Crescent and the railway lines. Looking back across the bridge over Dive Crescent. 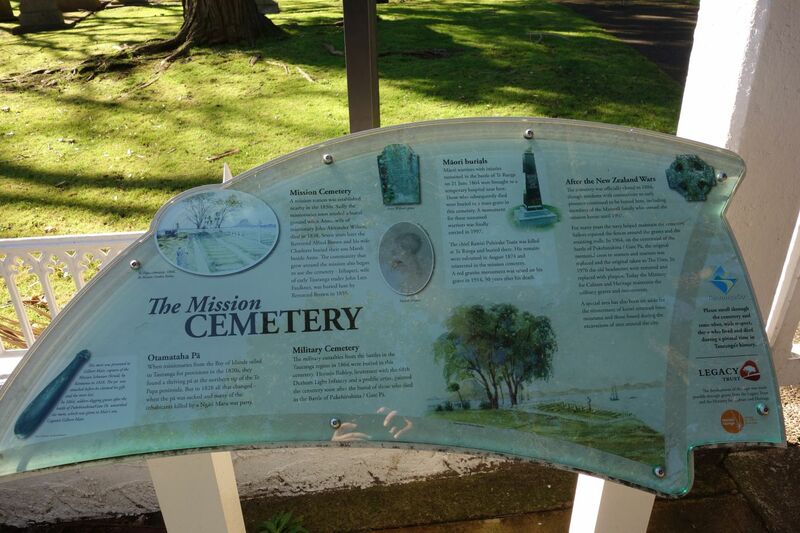 Mission Cemetery, with an information panel. Returning to and walking along Cliff Road leads to the Rose Gardens in Robbins Park on the left. 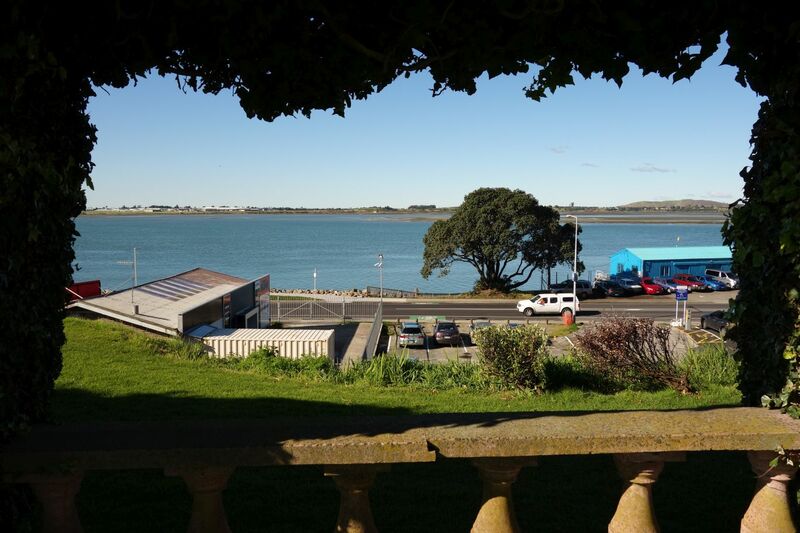 View from the Rose Gardens across Dive Crescent and Tauranga Harbour to Matapihi. 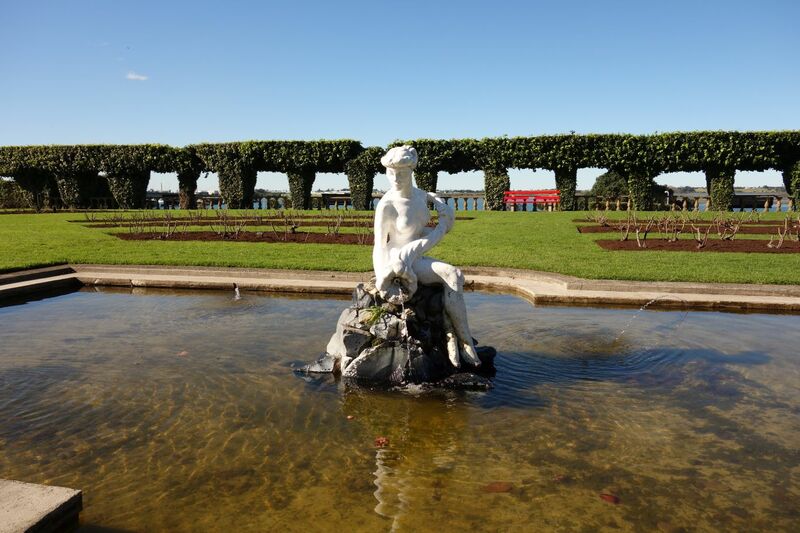 Statue in the Rose Gardens of Ceres, legendary protector of flowers and crops and the Roman goddess of plenty, sitting on a base of obsidian rock from Mayor Island/Tuhua. 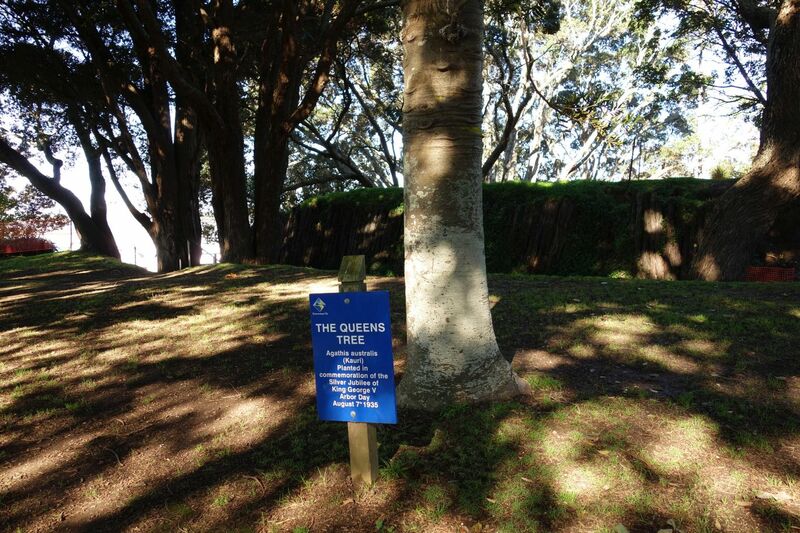 Adjacent to Monmouth Redoubt, with some of the embankment visible behind it, is the Queens Tree, a kauri planted in 1935. The entry to Monmouth Redoubt from Cliff Road. A memorial plaque in the redoubt with some of the history. 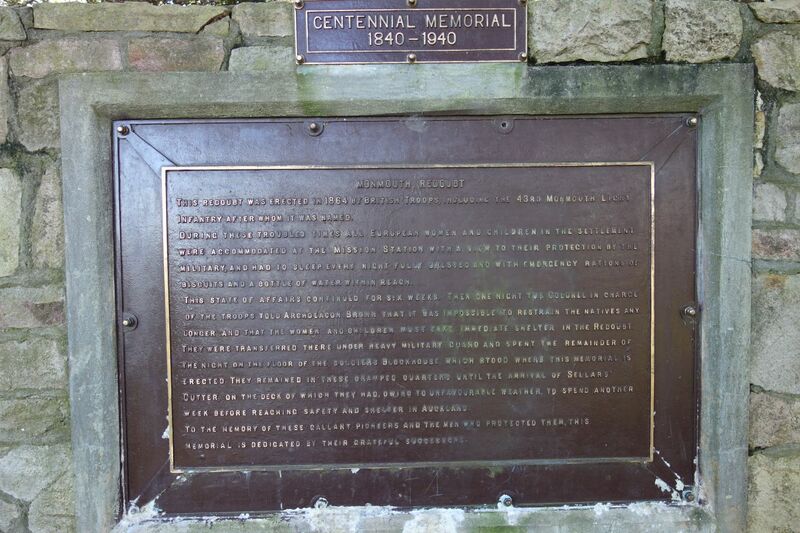 Presumably the centennial is from the signing of the Treaty of Waitangi in 1840, not the centennial of the redoubt which was constructed in 1864. 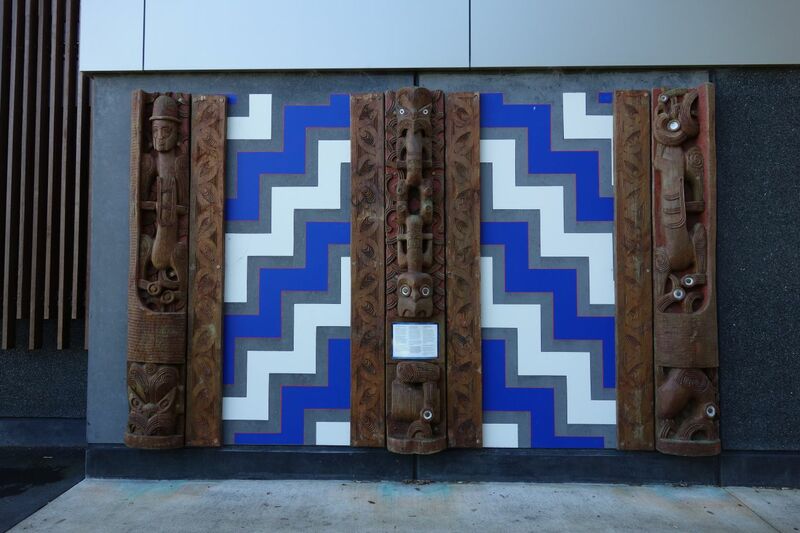 Carved posts and panels on the building just across Cliff Road from the redoubt entrance. 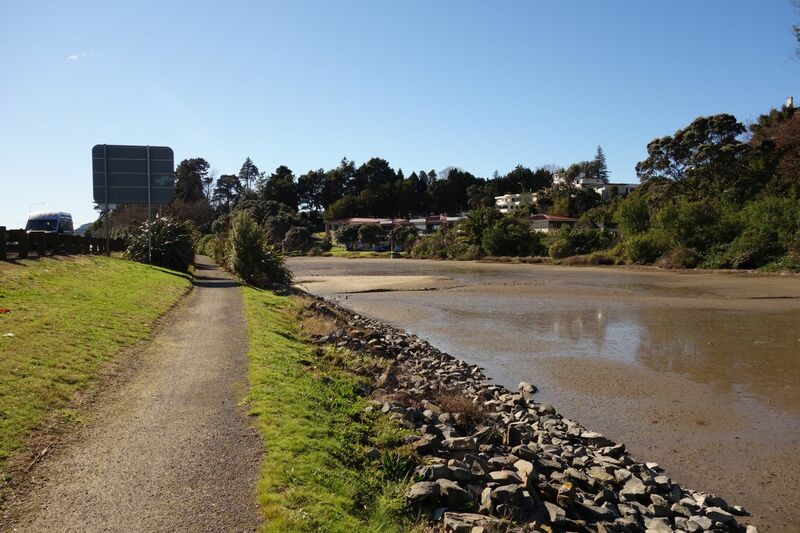 A path leads down from Cliff Road to The Strand, with Te Awanui Waka at the end of The Strand. 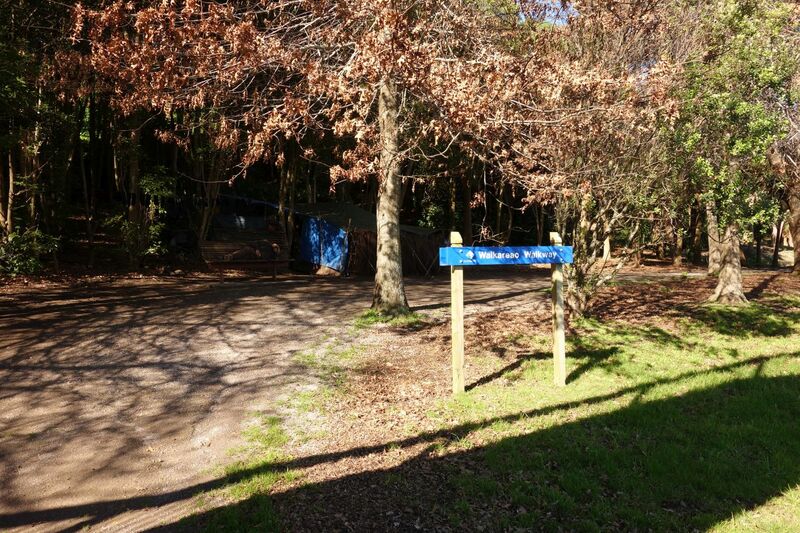 The shelter building, opened in 1975, is called Te Urunga. The area along the harbour across the railway lines running alongside The Strand. 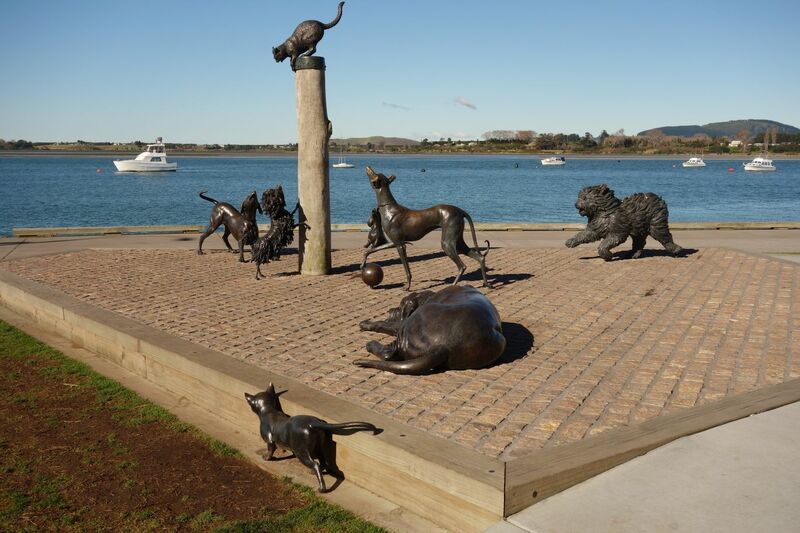 The recently erected Hairy Maclary and friends sculptures, based on the childrens books by Lynley Dodd. 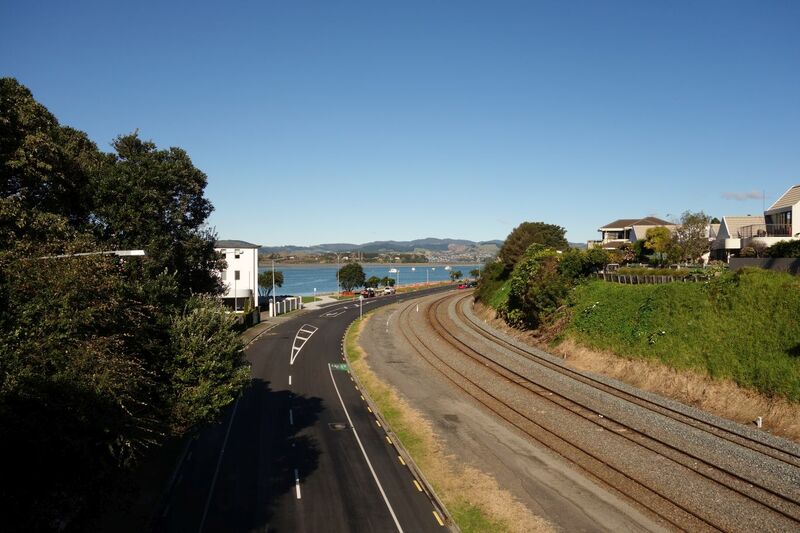 Approaching the railway and pedestrian bridge to Matapihi along the waterfront. There is a tight squeeze past the building at the far end to get from the walkway to get back onto The Strand. View from The Strand along the railway/pedestrian bridge to Matapihi. 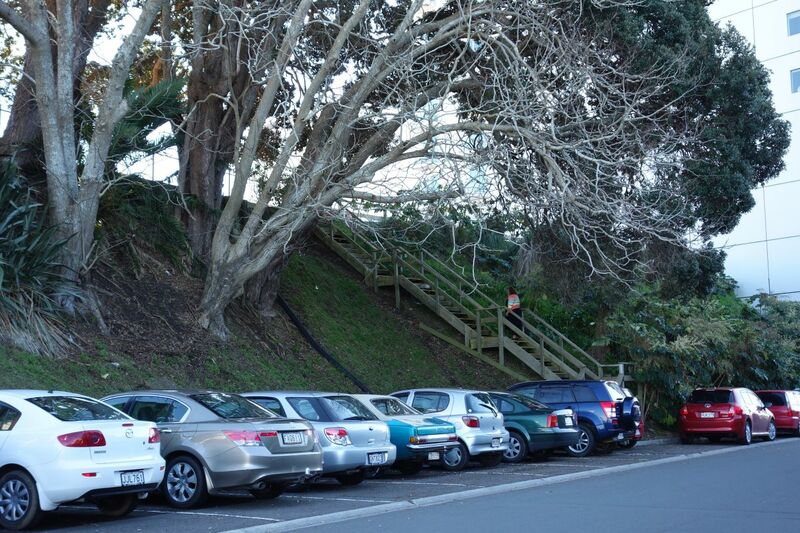 Near the pedestrian access onto the bridge, across The Strand, a set of steps leads up to Devonport Road, not far from Elizabeth Street. 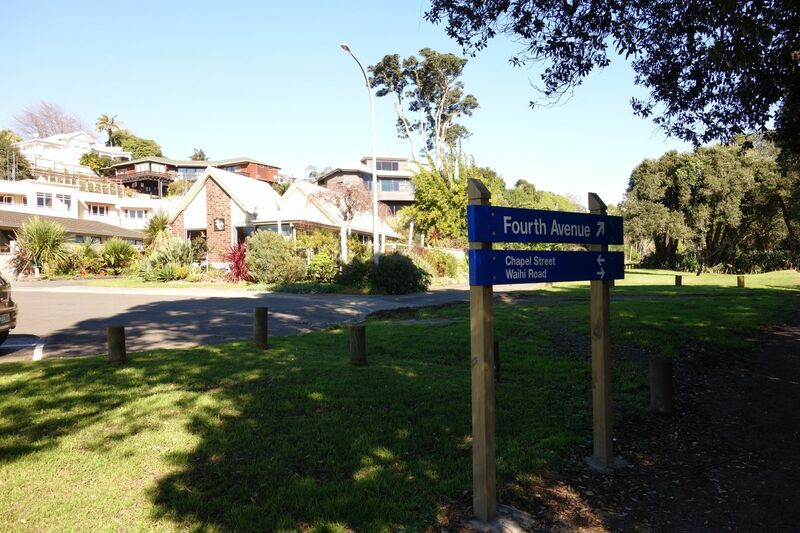 Instead of following Elizabeth Street back to Waikareao Walkway, this walk continued through the CBD up to Cameron Road and the Wharepai Domain. 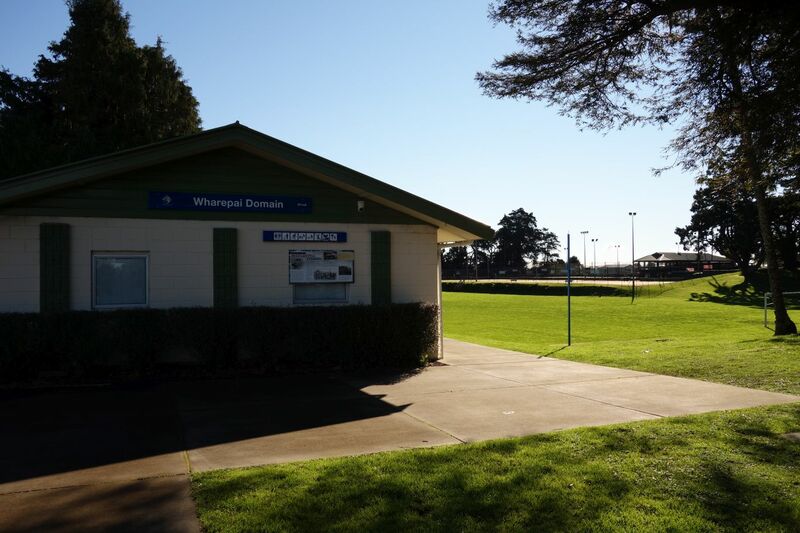 One entrance to Wharepai Domain is at the corner of Cameron Road and Hamilton Street. 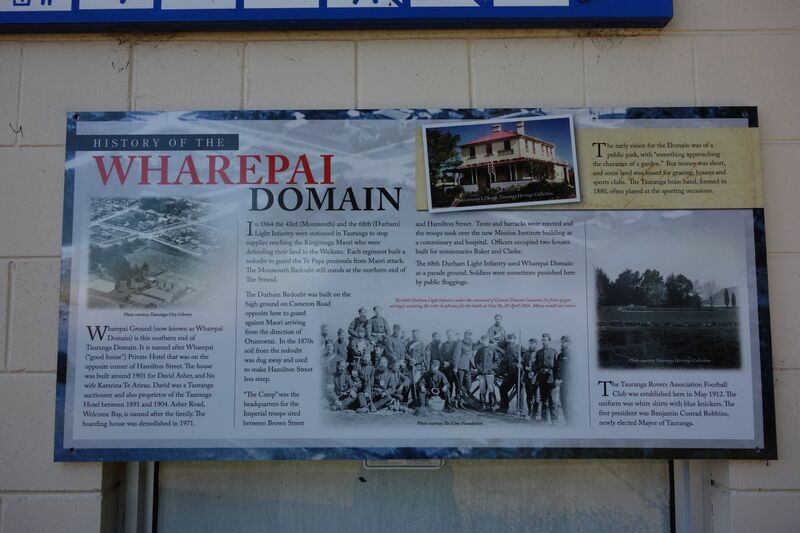 An information panel with history of Wharepai Domain. 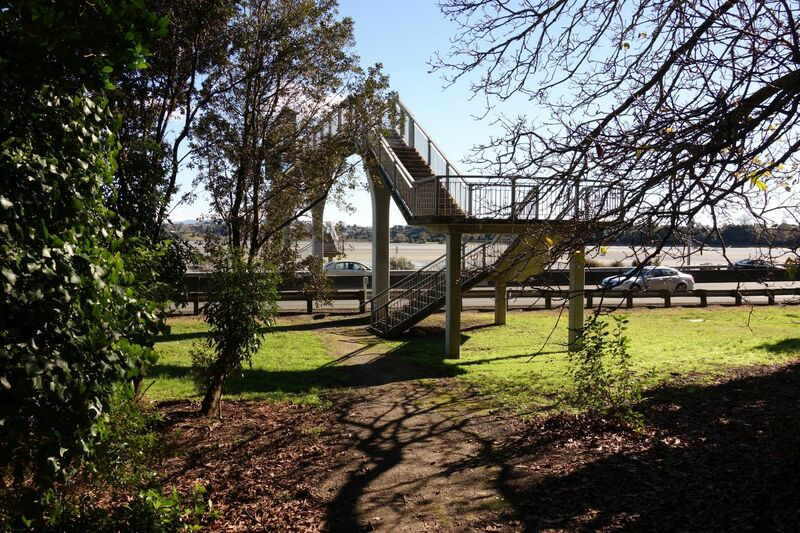 Crossing diagonally over the soccer grounds leads to the steps down to Waikareao Walkway and the pedestrian bridge over Takitimu Drive. 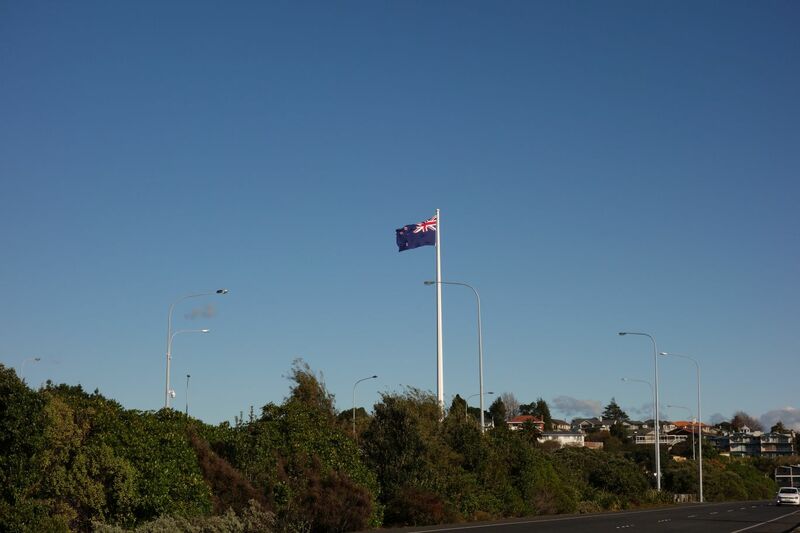 The flag on the roundabout on Elizabeth Street and Takitimu Drive on a breezy but fine day. The GPS tracklog shows the path taken, starting and ending at Waihi Road at bottom left. Various points of interest are marked. The total distance walked was 9 km, for a total time of 2 hours and 20 minutes. The loop starting and ending at the northern Takitimu Drive pedestrian bridge was 4.5 kms long, and took 1 hour 20 minutes. A satellite image of the area, courtesy of Google Maps. The tracks were walked on August 2, 2016. 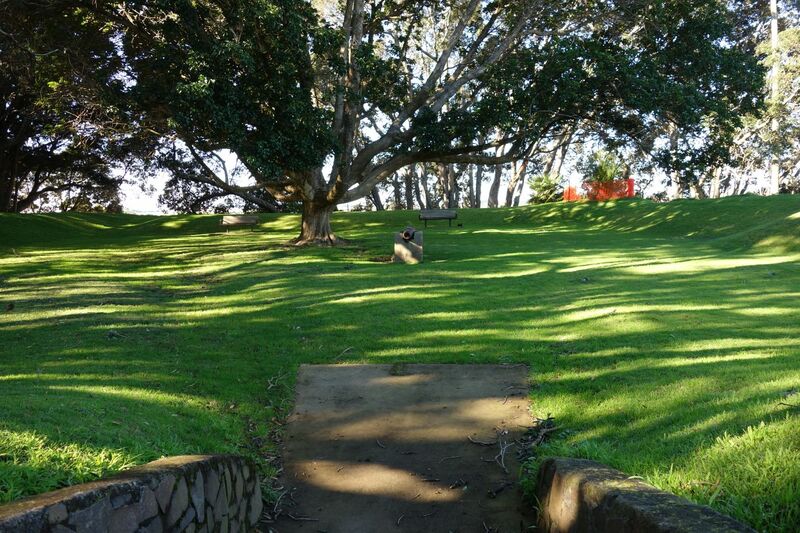 This entry was posted in Walks and tagged Mission Cemetery, Monmouth Redoubt, Robbins Park, Tauranga, The Elms, Waikareao Estuary Walkway, Wharepai Domain on 2016-08-03 by nzartig.